11 Responses to RP: Worst. Sidekick. Ever. I love that the robot’s name is “Bozo”. Apparently he had a career before becoming a beloved TV clown, who knew? Although you can’t see it here, the robot flies via a big disc mounted on his head like a beanie propeller. That’s awesome. And I love that it’s not a suit, but a robot that Hugh Hazzard CLIMBS INTO. Because when building a complicated independent robot, it’s important to leave enough dead space for a whole dude to crawl into. I thought it was sarcasm with a name calling to start. Then I realized that Bozo it the name of the robot. Good to know ol’ Hugh has enough debonair-man-of-action fashion sense to climb into a tin can wearing his best double-breasted suit with natty starched kerchief. The Grecian Formula is a huge plus. Can’t be seen as anything less than your best when fighting crime! …and where, exactly, are Hugh’s legs whilst safely ensconced inside said Bozo? It appears to me that both of his legs are down in Bozo’s left leg. The crisp look afforded by pomade is especially appropriate when riding in the hollow leg of your robot companion. Hugh looks more like an evening anchorman than any sort of crime fighting hero. One of the reasons I started downloading these Smash Comics was the prominent role Bozo plays on most of the covers. 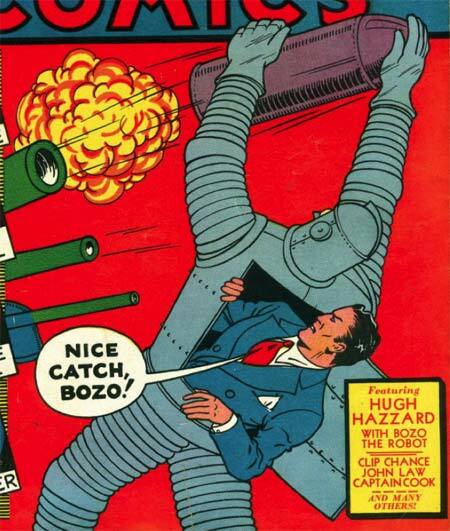 Setting aside “Bozo the Robot” as one of the worst names ever, the series is actually titled “Hugh Hazard and his Iron Man”, which I thought was kind of cool considering the later Iron Man. Thankfully they left off the flying propeller beanie in the later version, though. The whole story line has that classic Golden Age sheen of nonsense, with Hugh having stolen the robot from some enemy bent on the destruction of America, only for Hugh to reprogram it. They constantly blur the line between this thing as a suit of armor and an independent robot, though. I imagine Hugh crammed in there amid all the circuitry, blind as a bat, controlling the robot with his remote control (seriously, he uses a remote). Ah, the Golden Age, when anything went except thinking things through too thoroughly. I can’t believe they actually have Hugh coming out of a cabinet like door on the robot’s back instead of a trapdoor on the robot’s bottom. Also did anyone else notice the size difference between the missile and the barrel it was shot from? Hugh has to be inside so his hair can keep Bozo lubricated. Hugh Hazzard is a good guy to know if it’s moving day.